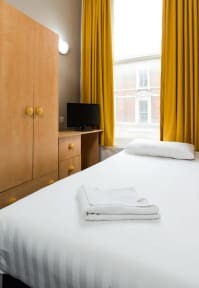 Aquarius Hotel is situated a minute’s walk from Earl’s Court Tube station, Aquarius Hotel offers accommodation in the heart of Kensington. It is the ideal choice for tourists and business travellers alike. Free breakfast included when staying with us. The museum district of South Kensington and Hyde Park can both be reached within a 10-minute walk, along with a range of pubs, restaurants and shops. Heathrow Airport is a 25-minute taxi ride away. Bus Hop-on & Hop off services are available from 10 minutes walk and we also help our guest to book the tours and all other tour too. We offer various rooms from single to quadruple rooms. 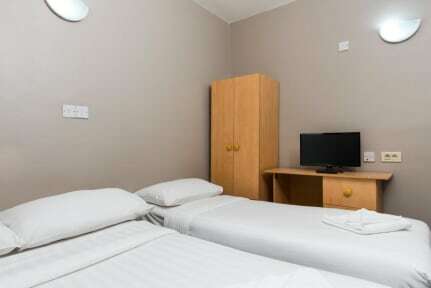 Each room comes with an en-suite or shared bathroom and a TV. WiFi Internet available at small additional cost. This property is allow to pre-authorise your card before arrival, if any card is not valid property will ask you a valid one, if you don't collaborate to offer a card with sufficient credit, your booking will be cancelled. Child friendly. No child under the age of 16, we only accept if he/she with parents or guardian. Clean and comfortable in a very good location. It's a cheap hotel and it feels cheap, but it's not unpleasant and it's well-located. The beds were broken and very uncomfortable, but still the room and bathroom were clean and the staff were friendly. Breakfast is super minimal but free. You get what you pay for and it's really not that bad, what you expect for the price with no nasty surprises. - the rooms did not like like those seen on the pictures: our room was very small, we were 2 and basically walking on each other. The bathroom was tiny. - the breakfast was minimal but ok - I think it is one of the last hotels where you still have to pay for the WiFi, which was 3 pounds per mobile per day, which makes it a lot of money. And when I bought it for my computer, it wasn’t working and the staff really wasn’t helpful. - you have to pay for all the facilities - I don’t advise it. The walls are very thin and you can hear everything from the other rooms, and the floors upstairs as well. The bathroom weren't really clean, but you can get away with it if you wear flipflops to the shower. It is okay for a short stay. Was not ensuite, as expected from the booking. Room was tiny (although this is to be expected for this price) but no window and a very noisy blocked fan was the only source of air! The sink was blocked and the walls were dirty. The staff there need be more friendly. All facilities require that you pay, especially early check-in, late check-in, internet connection other things. My room was situated below the level of the street, and I heard the trains all night. Room was unclean and floor boards creaked away from room above me until 2am in the morning keeping me awake. Bed stand had collapsed at both ends and left me with a bad back in the morning. One of the worst places I've visited ever and certainly not worth your time no matter what the cost and I'm known as a person who can sleep just about anywhere! Do not stay here.